AS ONE INTERNATIONAL is proud to offer Histofine IHC (Immunohistochemistry) detection kits for human, mouse, rabbit, and goat primary antibodies. 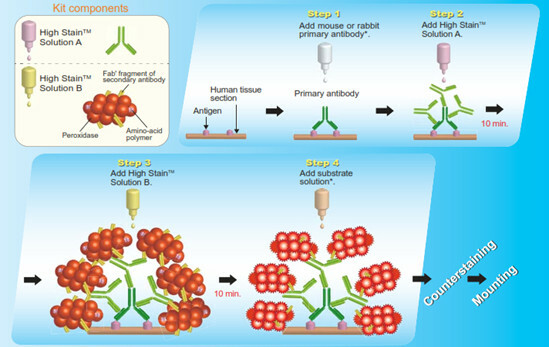 Uniquely, these kits use just the antigen-recognizing Fab fragment (rather than a whole antibody) to detect a primary antibody. This feature minimizes non-specific binding, thereby increasing the signal-to-noise ratio and generating cleaner results. Histofine High Stain HRP is the Two-Step Polymer Detection System for IHC staining providing more amplified staining intensity compared with conventional one-step polymer detection system. This system is applicable to both of mouse and rabbit primary antibodies and is for formalin-fixed, paraffin-embedded tissue sections. 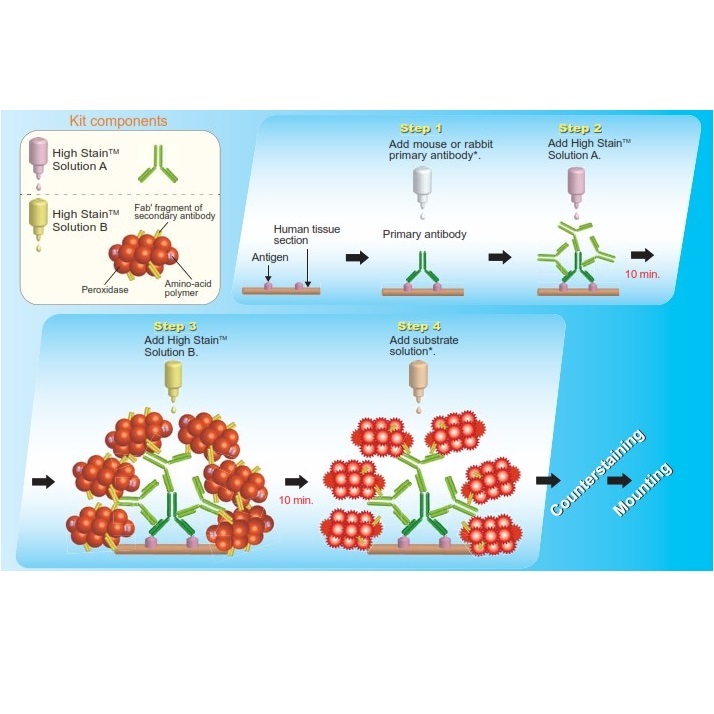 It is the labeled polymer prepared by combining amino acid polymers with multiple molecules of peroxidase and secondary antibody which is reduced to Fab’ fragment. To eliminate background staining, solid-phase adsorption of secondary antibody is conducted with human serum. 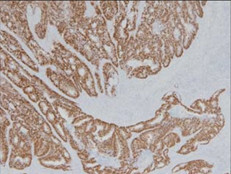 Human colon cancer tissue stained with CDX-2 rabbit monoclonal antibody and Histofine High Stain HRP and DAB chromogen. Positive reaction is observed in nuclei of sporadic tumor cells. Histofine is a universal immuno-enzyme polymer that is used instead of a traditional secondary antibody in IHC staining. Histofine is multiple Fab’ fragments bound to several substrate enzymes such as HRP or AP. Unlike conventional IHC staining with one secondary conjugated antibody detects a single primary antibody, Histofine Simple Stains has multiple Fab and substrate enzymes detecting a single primary antibody. The systems use a precisely cleaved secondary antibody conjugated to an amino acid polymer and multiple enzyme molecules. Two Histofine Simple Stain systems are available from AS ONE International: Histofine Simple Stain MAX PO and Simple Stain AP. 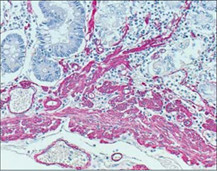 Both Simple Stain systems are detection reagents designed specifically to allow immunohistochemical staining on formalin-fixed paraffin-embedded human tissue sections. It is the labeled polymer prepared by combining amino acid polymers with multiple molecules of peroxidase (PO) or alkaline phosphatase (AP) and secondary antibody which is reduced to Fab’ fragment. To eliminate background staining, solid-phase adsorption of secondary antibody is conducted with human serum. Simplified staining – Cuts down the conventional streptavidin biotin detection system of 5 steps to 3 steps: Primary antibody → Histofine®Simple Stain → Substrate, eliminates the need for blocking and combines enzyme and secondary antibody into one step. High sensitivity – A shorter polymer length allows deeper tissue penetration with significantly more enzymes and secondary antibodies per detection molecule compared to conventional methods. Human breast cancer (treated with high temperature epitope unmasking method) stained with Histofine Simple Stain MAX PO (M) and DAB chromogen. Nuclear staining of breast cancer cells is observed. 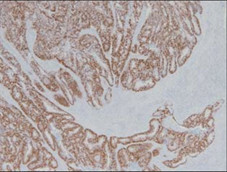 Human colon stained with Histofine Simple Stain MAX PO(R) and DAB chromogen. Cytoplasmic staining of nerve cells is observed. Human breast cancer (treated with high temperature epitope unmasking method) stained with Histofine Simple Stain MAX PO (MULTI) and DAB chromogen. Nuclear staining of breast cancer cells is observed. Human stomach stained with Histofine Simpel Stain AP(M) and New Fuchsin chromogen. 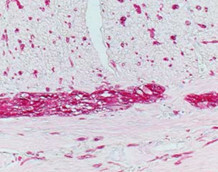 Intense staining of smooth muscle in the walls of blood vessel and muscularis mucosae is observed. Human colon stained with Histofine Simple Stain AP(R) and New Fuchsin chromogen. Cytoplasmic staining of nerve cells scattered in smooth muscle and Auerbach’s plexus is observed.